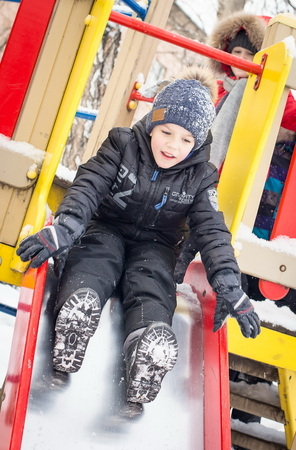 Tips on Outdoor Winter Play for Children | Rubber Safe Playgrounds Inc. Most researchers and doctors agree that kids should be playing outside and getting exercise for about 60 minutes each day. Unfortunately, this can be extremely difficult during the winter months – especially with the frigid temperatures we’ve been experiencing lately. Parents obviously don’t want their children playing outside in the cold, and as a result, kids can end up spending the majority their days inside during the winter, and not exercising. In turn, this can also lead to the development of bad habits that extend even into the warmer months, such as a desire to just sit and watch TV or play video games all day. While you should be mindful about how much time your kids spend outside in the winter, you don’t need to completely cut them off from Mother Nature once it gets cold, as long as you take the proper precautions. By monitoring how long they are outside and making sure they are dressed appropriately, you can ensure that they have fun and get the exercise they need without risking frostbite or getting sick. According to A Healthier Michigan, one simple way to figure out how long your kids can safely play outside in the winter is by paying attention to the wind chill factor. If the wind chill is at 32 degrees or higher, you can allow your kids to play outside for the day. If the wind chill sits somewhere between 13 and 31 degrees, playing outside is still OK as long as you make your kids come in every 20 minutes or so for a break. If the wind chill drops any lower than that, however, then you should make your kids come in and save the outdoor play for another day. In addition to watching the wind chill, you should provide your kids with the extra layers of clothing they’ll need in the winter to avoid frostbite and hypothermia. Jackets should obviously be worn at all times, as well as warm hats, waterproof gloves, and scarves. On especially cold days, you might even want to consider dressing them in a base layer to manage moisture and another layer of insulation to trap the heat in. He or she can always come in and take something off if they get too uncomfortable, but layering up is the way to go during the winter, providing your child with plenty of warmth. At Rubber Safe Playgrounds, we love to see kids playing outside and having fun at any time of the year, on or off the playground. Even though it’s cold, it’s good for kids to get out and run around in the snow, burning off that extra energy and getting the exercise they need. All it takes it a little extra monitoring from mom and dad to ensure they enjoy themselves safely!